Even after being in this business for so long and really learning how to be a ticket broker, I still find myself in situations that are completely unexpected. Ticket brokering is a very learnable and masterable business, but you always have to keep your eyes open because there are so many variables to take into account. This is the Comcast Center. If you look closely, you’ll notice something strange about this venue. The section numbers look normal and ordered in the right way. It’s easy to miss at first glance, but take a look at those row numbers. Row F is the very first row in Sections 1 and 3. Row M is the first row in Section 2. Row C is the first row in Section 7.
Who knows why the people who designed the Comcast Center decided to designate these Rows the way they did. Maybe this is only the case for General Admission Pit shows? Whatever the case may be, you’ll need to be on top of all this if you’re planning to learn how to sell concert tickets online. When it comes to the Comcast Center, pulling Section 3, Row F tickets are possibly the most profitable tickets you could probably buy. But if you hadn’t checked out the seating chart beforehand, you would not have known that. Many beginning ticket brokers think that each concert venue has just one seating chart, and this can cost them big time. The truth is, each concert has a seating chart. Bon Jovi likes to have a Pit, with Floor sections behind them. Daughtry likes to have a catwalk, with Floor sections to its left and right. John Mayer likes to have reserved seating right in front of the stage. Each artist has their own style and each venue will try to accommodate that style as best they can. Never assume that because the show is taking place at the Wachovia Center that you can just look up “Wachovia Center” in Google Images and be all set. In my experience, there are three ways to find seating charts that are specific to a particular show. Although these charts are the prettiest, be warned that they are not always accurate. They get it right most of the time, but you’ll have to check with at least one of the other 2 resources (which I’ll soon mention) to verify that Ticketmaster is accurate. In many cases, Tickemaster will already have selected the artist that you’re looking to buy tickets for, but not always. If you don’t see the exact artist name on that list, you cannot be sure that Ticketmaster is giving you an accurate seating chart. These seating charts aren’t as pretty as Ticketmaster’s, but they’re pretty much always accurate. If StubHub’s seating chart disagrees with Ticketmaster’s, I would trust StubHub’s every time, especially if the artist name was not on Ticketmaster’s list. I’m not quite sure why StubHub and Ticketmaster sometimes disagree on seating charts, but I assume it’s because StubHub offers an interactive seating chart and Ticketmaster does not. In other words, if StubHub’s seating chart is wrong, sellers will immediately start to complain because they will be unable to submit their listing, or worse, they will be forced to submit it inaccurately. So it’s in StubHub’s best interests to always provide accurate seating charts. Do not trust the stock concert seating images they give you on their website. If you want to be absolutely sure, you must call them up yourself. In all my experience as a ticket broker, I’ve only had to do this once, but it will save you a big headache later on. If the Sun National Bank Center representative tells you that on June 20, the Daughtry show will have a catwalk with Sections 1 and 2 to its left and right, that’s all the verification you need. Seating charts can be tricky. Next time you pull a Row F, make sure you didn’t just pull tickets for the front row! Those would be a shame to toss back. And all you have to do is check. I bought your e-book and although slightly overpriced, I think it has a lot of great information. I do want to let you know that Stubhub is trending towards E-tickets as the more popular selling form of tickets. I have a friend who works at Stubhub and he monitors all tickets sold and he has come to the conclusion that instant E-tickets are the best way to go for sellers. His contact information is Tmason@stubhub.com if you would like to ask him questions directly. Also, I would like to request that you create a post with upcoming HOT concerts you think will be good buys both for value and profit capabilities. I think that would be very helpful to us that bought the E-book. Yeah, StubHub has been trending toward e-tickets. It’s a change I began noticing a few months ago. Thanks for that contact–good to know! Bought the book. Learned one thing only, but it has made me more than you charged for the book. Question: What is the formula for not getting locked out of TM? I do it everyday. NOT sure WHAT P1 means? Also, are these good seats? Those are pretty good seats. P1 means price level 1. P2 and P3 are farther away from the stage. You’re directly in front of the stage, a few rows back. If there’s a GA Pit for your concert you’ll be behind that, also. Hey. I just stumbled upon this while looking for info on my ticket and this was pretty interesting. I figured I’d leave a comment because you might be able to answer my question. I just purchased a Section 8 Row Z ticket for a concert this summer at the Comcast Center. I was looking at the seating chart and it said the rows were A-CC. I know there aren’t 81 rows in the section, so how do the lettered rows work in that section? 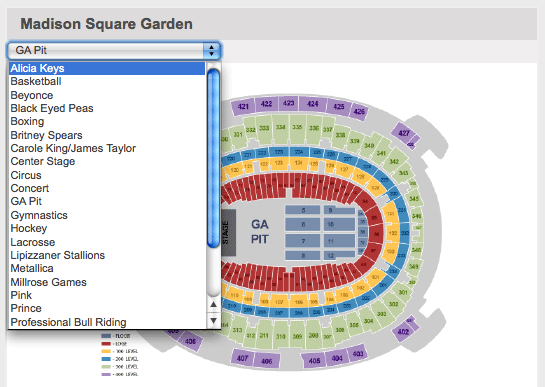 I wouldn’t strongly disagree that StubHub has accurate seating charts. Not just compared to TM, but ever. They tend to use the standard Floor/Orchestra setups, even when they clearly don’t apply to the show in question. They also label sections very awkwardly, making it confusing when customers receive their tickets and the printed ticket sections don’t match up with the StubHub section names. TM definitely leaves a lot to be desired with seating charts, but it’s generally just a matter of detail or leaving out Pit sections. Hello. For the brokers it is best to buy tickets for Row F.
That’s the best answer by far! Thanks for contirbuntig. I want to buy tickets on StubHub and they are listed as etickets. If I buy them is it possible to get StubHub to contact the seller and ask to get me the hard tickets? Is that a possibility at all? Why do some list the tickets as available to ship 3 days before the show. If supposedly you are supposed to have the tickets as you list them. Are section 4 row L seats good? Hello! 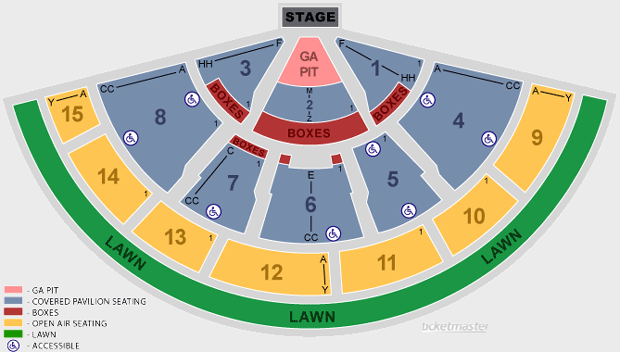 I have 4 tickets for one direction on June 26, 2013, section 3 row BB seats 3-6. I was wondering how many rows these are from the stage? Any help would be appreciated! Thank you so much! I have tickets for Fleetwood Mac @ the Comcast Center in Mansfield Ma for June 21. What can you tell me about these seats? Are they close to the stage? I discovered the most ideal position for my needs. Contains amazing and useful information. I have study most of them and has a lot of them. To me, he’s doing the excellent perform. Wow thanks so much for this article! I’m in Row P of section 2 and I was under the impression I was going to be in row 16! But now thanks to you I almost had a heart attack (which is good!). Thank you! !